This is a part of an article that was published in the Eichler Network eZine. See reference to the source at the end. It is re-posted on the blog section of Go2 Design Studio. 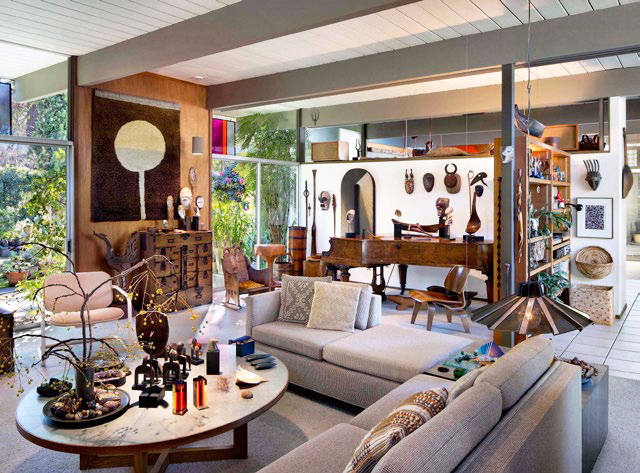 Staging for living is much more personalized—like with the seemingly cluttered (but actually well organized) living room (above) of Eichler’s late design consultant, Matt Kahn. Closet and garage organizational systems, like the one featured here from Modern Mecca designer Claudia Desbiens, are a good way to put clutter out of sight and bring visitors’ eyes back to the architecture. 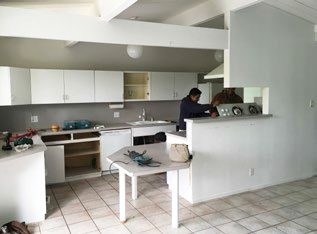 Another amazing before-and-after transformation from realtor Renee Adelmann: clutter be gone. The layering of interior lighting is essential for enhancing the ambiance and functionality of a MCM home. In the two photos here, designer Claudia Desbiens of Modern Mecca brings together several types of light sources to assist with the layering process. This includes the use of bubble lamps (above), an Eichler favorite. 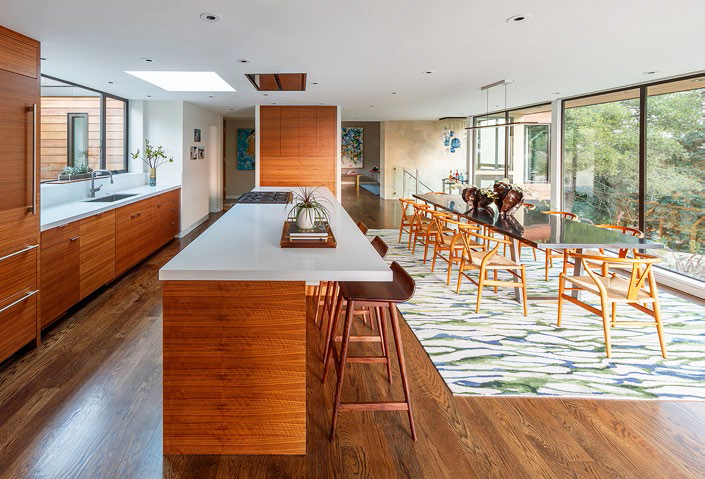 In this design by Laura Martin Bovard Interiors, the use of an oversized, playful rug helps to comfort the eye in the transition through this long galley kitchen. Finishing touches of artwork, textile accents, and throw rugs are marvelous ways to introduce color, pattern, and texture. 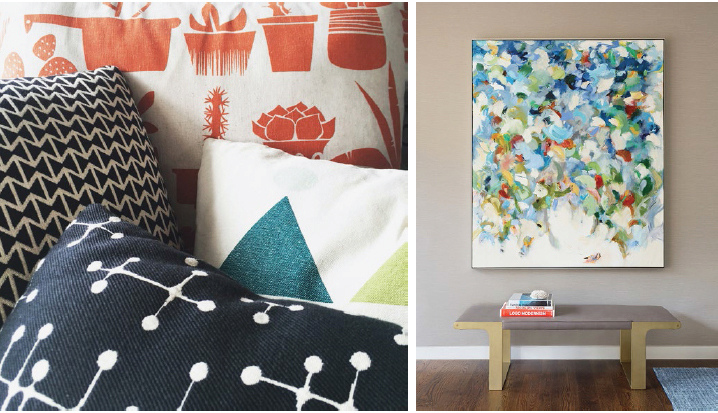 Designer Camila Baum of Redux Stage Co. does it here with pillows (above left), while Laura Martin Bovard adds a nice, colorful splash with artwork (above right). Janelle Boyenga of Boyenga Team, Lucile Glessner of Lucile Glessner Design, Rachelle Padgett of Synthesis Interiors & Color, Camila Baum of Redux Stage Co. and Severine Secret of Go2 Design. If you think ‘floating furniture,’ ‘layered lighting,’ and ‘proven dishes’ sound like thematic content from your favorite home-improvement TV channel, you may be right. But, more importantly, when you link these terms specifically to the mid-century modern lifestyle, they refer to useful ways for enhancing the look, feel, and personality of our homes’ interior spaces. 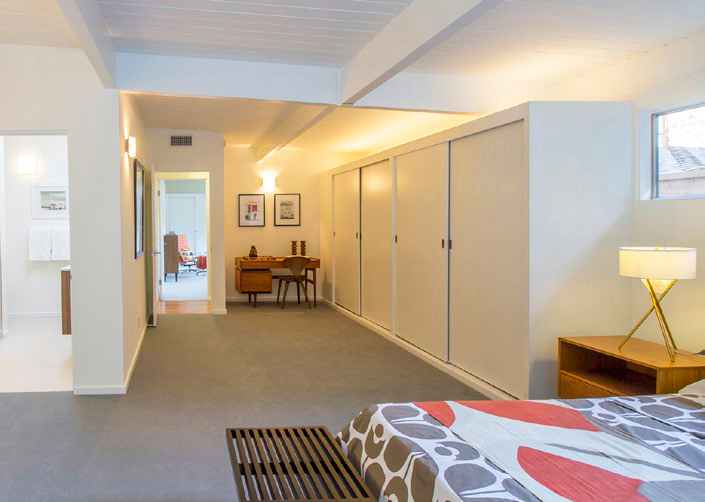 Eichler’s architectural features were fashioned to highlight each home’s natural elements. The outdoor-in glass aesthetic invites light and fresh air—nature’s disinfectants. Open floor plans and simple, clean, angular lines help to gently define spaces that flow one into another. Natural materials such as wood, cork, and stone harmonize to create interesting, yet surprisingly tranquil spaces. It’s helpful to keep these natural elements in mind when designing and decorating your home’s interior spaces—organically planned so long ago and so highly sought after today. Drawing on the rich resources of stagers and interior designers, and applying certain universal themes—along with some personal ingenuity of your own—can help you enhance your own spaces, whether it’s for everyday living or for hosting social events. Harmonious interior design, however, is not always intuitive. Studying photographs or attending well-staged open homes can be exciting: most of us instinctively know ‘that special look’ when we see it, but can’t always say why one thing works and another doesn’t. The knowledge and skills of professional stagers and interior designers can provide insight into improving the look, flow, and utility of your living spaces. 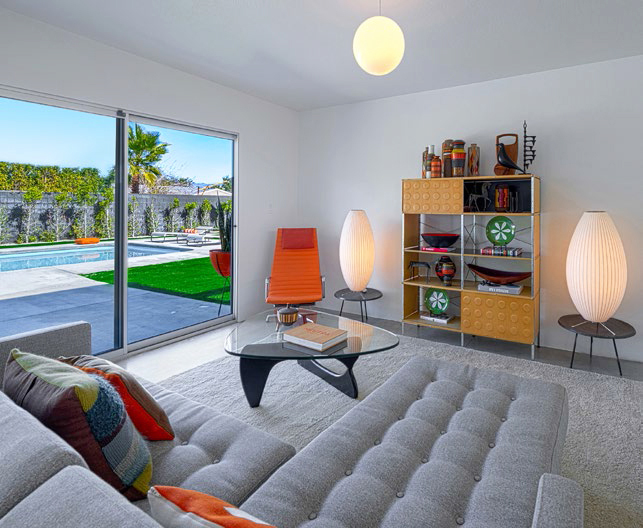 Aided by their input, let’s apply some successful staging techniques for improving your home’s interior, with an emphasis on understanding and incorporating Eichler-friendly design principles. So…the family has decided to hold its annual shebang at your home. No need to panic. Help is on the way. 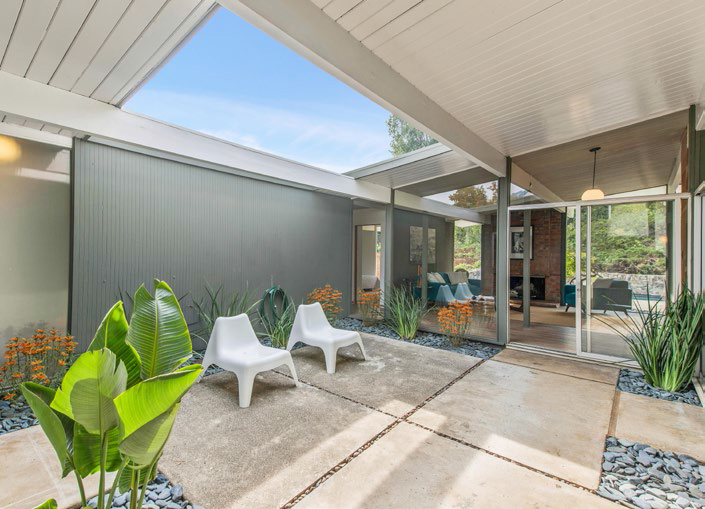 When it comes to designing and decorating your modernist spaces, the basics include decluttering, cleaning, and letting in fresh air, paying special attention to the glass, since it’s such a prominent feature of Eichler homes. Dealing with organizing, lighting, furniture (style and placement), and color are also important. After that, it’s finishing touches—art, texture, and textiles. Declutter, but personalize. Make sure your horizontal surfaces—tables, desks, and counters—are clear and clutter-free. Nobody likes to enter a home and see things piled on top of tables and kitchen counters. So get rid of those eyesores, either temporarily (boxed in the garage or storage unit) or consider donating useful items to someone who needs them. Personalizing just means that this is your home and should reflect your personality, family memories, and preferences. So, unlike staging for sale, keep those family photos and children’s art on display but consider organizing them on a wall rather than a tabletop. We all know what cleaning means, and some of us may be fortunate enough to have a cleaning service on hand. Regardless, cleaning your glass (windows and doors) is especially important for making your home shine. Who wants to look at a garden through smudged fingerprints? Paying attention to the floors, including removing trip hazards, is also important. So is basic dusting of furniture and getting rid of cobwebs. Visitors to your home will notice scents you don’t because of a principle called olfactory fatigue (or ‘nose blindness’), the inability to distinguish a particular odor after prolonged exposure. Furthermore, many people are bothered by strong smells, especially chemical ones, so air out your house often, paying special attention when guests are expected. Replacing tired plants with new ones can also add a clean, fresh ambiance to your interior. “Everything in your home should have a home,” Boyenga says of the placement of personal items inside the house. “And while part of Eichler’s architectural beauty—clean, bright open living areas and unbroken lines—makes these homes so sought after, it can also create storage challenges.” Closet and garage organizational systems, such as those offered by Valet Custom Cabinets & Closets, California Closets, and other companies, can provide additional solutions to this oft-encountered conundrum. 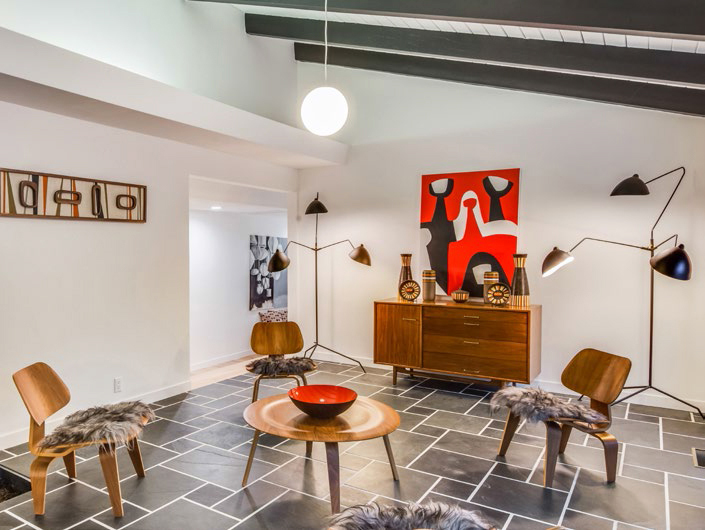 The layering of interior lighting, whether used specifically for entertaining or just for everyday activities, is often overlooked, but it is essential for enhancing the ambiance and functionality of a mid-century modern home. “Having one bright overhead light can cast unattractive shadows or images that are generally harsh and not particularly flattering,” observes Padgett. Does the light-layering concept mean you should discard your beloved halogen tracks? Certainly not. Regardless of whether they’ve been replaced with LEDs or not (LEDs being more energy efficient and California Title 24 compliant), track lighting remains both functional and flexible, especially when enhanced with dimmers. Individual track lights can also be moved, redirected, or temporarily removed, and then augmented by eye-level lamps to add warmth and eliminate unwanted shadows from your guests’ faces. Stager Camila Baum is fond of the original Eichler globe lamps, but suggests augmenting them with bubble lamps since the globes aren’t very bright. The living room is generally the most important room in the house, especially when hosting guests, and it is often the main entry space of your home. This is an excellent room for illustrating the concept of floating the furniture—something that modernist furnishings were designed to do. The principle of floating can make a world of difference in opening up a space. As South Bay interior designer Lucille Glessner, of Lucile Glessner Design, notes, “[In your living room] you want pieces that are somewhat floating in the space. 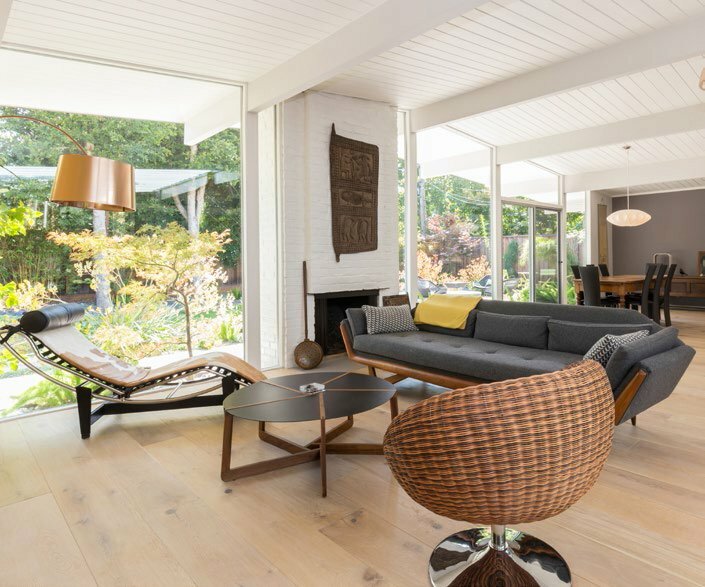 It means that furniture is not sitting directly on the floor, but has legs—often slanted—allowing the floor to show through.” If you look closely at some of the most renowned mid-century modern furnishings, you’ll see how effective this subtlety is. Grouping smaller pieces together can also be functionally valuable by creating multi-purpose areas—facilitating socializing, conversation, and collaboration—within your home. Another principle of floating involves keeping furniture away from the walls and windows, when feasible. For example, moving sofas and chairs out from the wall by two to three feet makes the room feel more open and spacious, frees up valuable wall space for art, and can also create pathways to walk around. Designers also caution against the natural urge to spread furniture pieces throughout an entire room. It’s not necessary to fill every corner; instead, creating groupings for seating and conversation within the space is very effective. 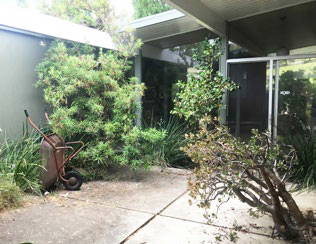 Being mindful of any breaks in your Eichler’s flow (or transitions) from one space to another can also help to show it off better. “Let’s say you have a home in which two adjacent rooms have different types of flooring, interrupting the flow of the home. You could counter-balance it by having some area rugs to draw your eye away from it [the break in flooring],” suggests Boyenga. Using proven dishes can help simplify tough home design decisions—especially when it comes to using color. Staying aware of your home’s outside-in structure—including walls and ceilings, and posts and beams—as it relates to interior paint selections, are important for continuing openness and flow. Whatever you start inside should also be carried to the outside, and vice versa, to avoid breaking up these prominent architectural features. 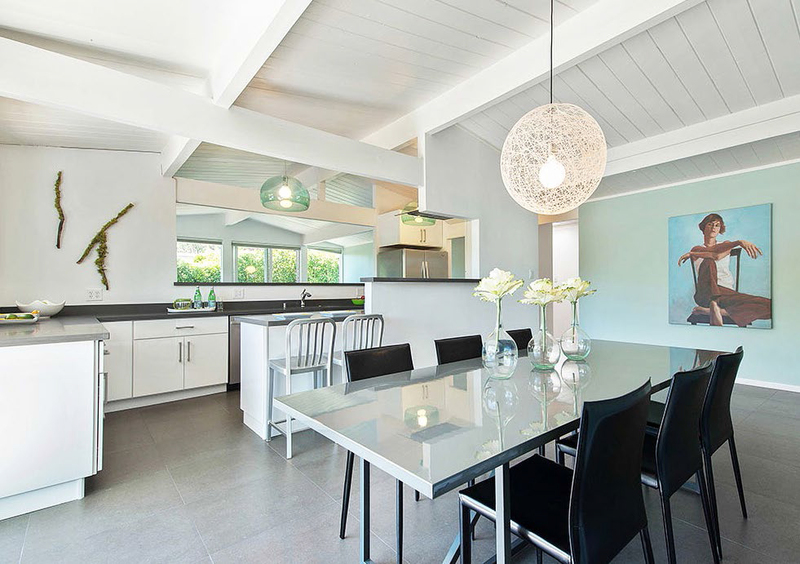 According to Janelle Boyenga, the original Eichler colors from the ’50s and ’60s have given us great proven dishes. “Now we’re using them [Eichler colors] again. They’re proven, right? We’re going back to the orange doors, the beautiful blue doors. So, proven dishes in this context would be the colors; the contrast; the textures from tile, stone, or wood; and the overall effect. Adding artwork, textile accents, and throw rugs are marvelous ways to begin experimenting with color, pattern, and texture. They are more economical and less permanent than painting or, say, changing out countertops. “Putting some art on the walls is a wonderful way to make your home feel warmer, more personal, reflecting your taste,” Padgett notes. Strategically selected and located pieces of art, including prints, paintings, textiles, and sculpture, can help provide a finished feel. They are also excellent vehicles for repeating a favorite accent color throughout multiple areas, giving your home a cohesive look. A simple piece of colorful fabric laid across the back of a chair or couch is an easy way to add color, texture, and visual interest. In the end, the architectural canvas is yours, but drawing on both time-tested and newly evolving design techniques can go a long way towards making your home look as special as it really is. Copyright © 2018 Go2 Design Studio . All Rights Reserved.